Eclipses occur due to shadowing of one celestial body by another. eclipses happen at the new moon and lunar eclipses happen at the full moon. There are between four and seven eclipses per year. Why not more? Eclipses do not occur for every new and full moon because the moon’s orbit is slightly off in relation to the Earth’s orbital plane about the Sun (the ecliptic). It orbits at about a 5o angle to our ecliptic. This means that the moon doesn’t always line up with our ecliptic at the new and full moon. Only when it does, at points called lunar nodes, do we observe an eclipse. During all other new and full moons, the shadows cast by the moon just miss the Earth or the shadows cast by the Earth just miss the moon. If you'd like, I can send this article as a pdf along with comprehension questions right to your inbox. Great for classroom use to reinforce ideas or as a sub plan. Where should I send it? Success! 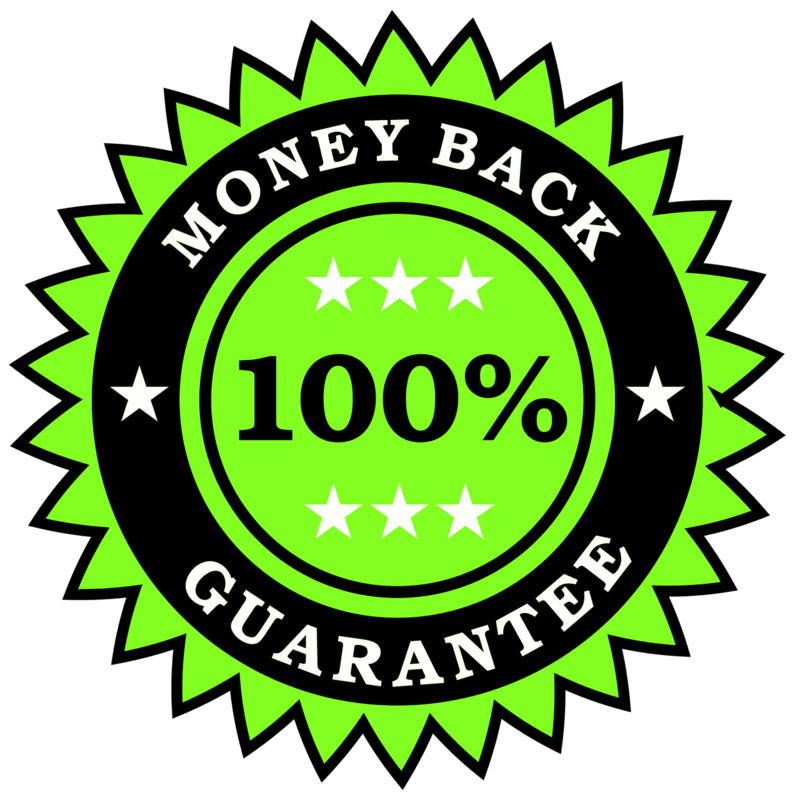 Now check your email to confirm and get your readings. Solar eclipses can be total, partial, annular, or (rarely) a hybrid between annular and total. There are two to five solar eclipses per year, but some are only observable in places with few to no people. Solar eclipses are named for their darkest phase. If a total solar eclipse is experienced anywhere on Earth, it is considered a total solar eclipse, even though other parts of the world experience only a partial eclipse. The diamond ring effect occurs before and after totality. Total solar eclipses occur when the moon fully covers the Sun, casting the darkest part of its shadow (the umbra) on Earth. The darkest point of the eclipse is almost as dark as night, but can only be seen in a narrow band, generally around 160 kilometers (100 miles) wide. This darkest phase is called totality. There are five phases of a total solar eclipse: first contact, second contact, totality, third contact, and fourth contact. During first contact, the moon just begins to cover part of the Sun. In the second contact phase, the moon covers the whole Sun, but some parts of the Sun remain visible. These visible sections result in such phenomena as the diamond ring effect and Baily’s beads. The diamond ring effect occurs around 10-15 seconds prior to and following totality. In this phenomenon, the Sun’s corona (outer atmosphere) can be seen around the edges of the moon as well as a single point of sunlight at one end, giving the appearance of a ring set with a single diamond. Baily’s beads can be seen around 5 seconds prior to and following totality. They are small pinpoints of light all around the moon, caused by sunlight shining through valleys and gaps between the moon’s mountains. During totality, the Sun is completely obscured, with only the corona visible around the edges of the moon. This full cover can even cause the temperature on Earth’s surface to drop. Animals often become silent during totality and people who have experienced it tell of a nearly indescribable feeling of awe. During third contact, the moon begins to pass off the Sun and the diamond ring effect and Baily’s beads can be seen again. Finally, in fourth contact, the moon moves completely off the Sun and the eclipse ends. In addition to Baily’s beads and the diamond ring effect, shadow bands and the Sun’s chromosphere can be seen around totality. Around a minute prior to totality, wavy light and dark bands may become visible, moving and alternating on surfaces such as walls and the ground. They occur because our atmosphere refracts (or bends) the Sun’s rays as they begin to disappear. The chromosphere is a low layer of the Sun’s atmosphere. It can sometimes be visible a few seconds after totality as a red glow. The next total solar eclipse will occur on August 21, 2017, and will be visible throughout North America, part of northeastern Europe, part of northern South America, and slivers of western Europe and northwestern Africa. Totality will be visible in a narrow band running across the United States from the northwest to the southeast. The following total solar eclipse will occur on July 2, 2019, and will be visible throughout much of South America, with totality visible in a narrow band through central Chile and Argentina. 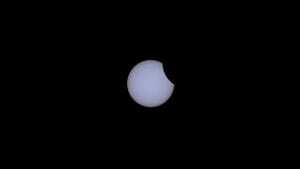 Partial solar eclipses occur when only part of the Sun is obscured. In partial solar eclipses, as the name suggests, the moon obscures only part of the face of the Sun. In this case, the Sun, moon, and Earth do not perfectly align. The outer portion of the moon’s shadow (the penumbra) falls on Earth. Partial solar eclipses can be of different extents, with some approaching totality. Partial solar eclipses have three phases: beginning, maximum, and end. 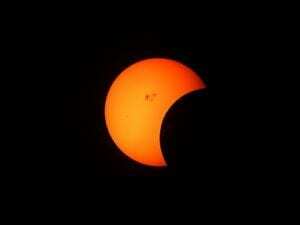 At the beginning of a partial solar eclipse, the moon just begins to cover part of the Sun. During the maximum phase, the moon covers as much of the Sun as it is going to. Finally, at the end of the eclipse, the Moon moves off the Sun. Partial eclipses account for around 35% of all solar eclipses and are visible to a larger swath of Earth, but are most common closer to the poles. The next partial solar eclipse will occur on February 15, 2018, and will be visible in most of Antarctica and some of South America. In an annular solar eclipse, the moon covers the center of the Sun. In annular solar eclipses, the Moon covers only the center of the Sun, resulting in a bright ring of sunlight around the moon, called the annulus, or “ring of fire”. The moon’s antumbra, the light part of its shadow around which the Sun is still visible, falls on the Earth. 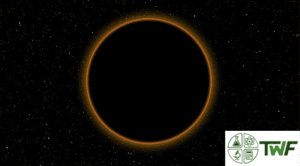 For the majority of the time an annular eclipse lasts (and in the majority of its observable area – around 150 km (93 mi) wide), it resembles a partial eclipse. The moon and Sun must be close to a lunar node and the moon must be near its farthest distance from Earth (the apogee) for an annular eclipse to take place. 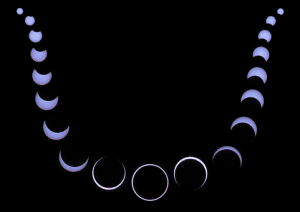 There are five phases of an annular eclipse, first contact, second contact, maximum, third contact, and fourth contact. In the first contact phase, the moon begins to cover part of the Sun. During second contact, the full eclipse, called annularity, begins, the annulus appears, and Baily’s beads may be visible. During the maximum eclipse, the moon is fully within the circle of the Sun. In the third contact phase, annularity ends as the moon begins to move off the Sun. Baily’s beads may again be visible. Finally, during fourth contact, the moon moves completely off the Sun and the eclipse ends. The next annular solar eclipse will occur on December 26, 2019, and will be visible throughout much of southeastern Europe, all of Asia, and part of western Africa and northern Australia. Its maximum will be visible in a narrow band through northeastern Saudi Arabia and Oman, southern India, and parts of Malaysia and Indonesia. A hybrid solar eclipse can appear to be either an annular or total solar eclipse. Its appearance is dependent upon where an observer is along the eclipse’s path. Because of the shape of the Earth, sometimes part of the eclipse path falls under the umbra of the moon and other parts fall outside that umbra. Just like annular or total eclipses, a hybrid eclipse begins as a partial eclipse. However, during its maximum, it will look different to people in different areas. 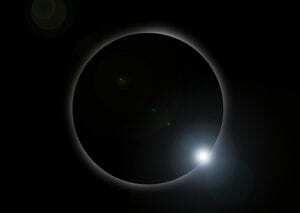 Hybrid eclipses are relatively rare, usually occurring only once a decade. Lunar eclipses can be total, partial, or penumbral. Lunar eclipses may not happen every year, but there can be up to three in a given year. Most years have two. Unlike solar eclipses, lunar eclipses are visible to the entire night side of the Earth. In a total lunar eclipse, the Earth fully shadows the moon. Total lunar eclipses occur when the Earth completely shadows the surface of the moon, blocking all light from the Sun. It is reflected sunlight that causes the moon to shine; it does not produce its own light. In a total lunar eclipse, Earth’s umbra falls on the moon, which remains visible due to the refraction of the Sun’s rays through Earth’s atmosphere. This results in indirect light falling on the moon, keeping it slightly illuminated. The atmosphere also only allows longer wavelengths to pass through. This causes the moon to appear red during most total lunar eclipses. However, dust and clouds within the atmosphere can filter out different wavelengths, resulting in the moon taking on yellow, orange, or brown hues. There are seven phases of a total lunar eclipse: beginning of the penumbral eclipse, beginning of the partial eclipse, beginning of the total eclipse, maximum eclipse, ending of the total eclipse, ending of the partial eclipse, and ending of the penumbral eclipse. During the beginning of the penumbral eclipse, the penumbral (outer) portion of Earth’s shadow begins to cover part of the moon. This phase is generally slight and hard to see with the unaided eye. As the partial eclipse begins, the umbra of Earth’s shadow begins to move over the moon. This phase is easier to see than the prior phase. During the beginning of the total eclipse, Earth’s umbra fully covers the moon. It is during this phase that the color of the moon changes. At its maximum, the midpoint of the eclipse, the moon is completely in Earth’s shadow. As the total eclipse ends, Earth’s umbra begins to move off the moon. Next, the partial eclipse ends as the umbra moves fully off the moon’s surface. Finally, the penumbral eclipse ends, and Earth’s shadow no longer covers any part of the moon. Total lunar eclipses account for around 35% of all lunar eclipses in a given year. People in one area can generally see a total lunar eclipse every two and a half years. The next total lunar eclipse will occur on January 31, 2018, and will be visible between western Africa and northeastern South America, with all seven phases visible in Western Europe, parts of Asia, and most of Australia, east to northwestern North America. In a partial lunar eclipse, only part of the moon is obscured. A partial lunar eclipse occurs when the Earth, Sun, and the moon are not perfectly aligned during a full moon, such that only part of the moon is obscured by the Earth’s umbra. The remainder of the moon falls under Earth’s penumbra. There are five phases of a partial lunar eclipse: the beginning of the penumbral eclipse, the beginning of the partial eclipse, maximum eclipse, the end of the partial eclipse, and the end of the penumbral eclipse. During the beginning of the penumbral eclipse, Earth’s penumbra begins to move onto the moon’s surface. As the partial eclipse begins, Earth’s umbra starts to fall on the moon’s surface. During the maximum eclipse, Earth’s umbra falls only on the outer part of the moon. As the partial eclipse ends, the umbra moves off the moon’s surface. Finally, at the end of the penumbral eclipse, Earth’s shadow moves fully off the surface of the moon. 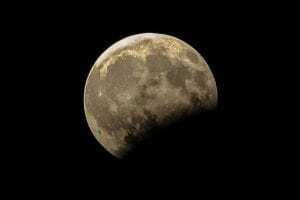 The next partial lunar eclipse will occur between July 16 and 17, 2019, and will be visible throughout South America, Africa, Asia, Australia, and most of Europe. A penumbral lunar eclipse is just what you might expect after reading the preceding paragraphs: the moon is only covered by the outer, lighter part of Earth’s shadow, the penumbra. Because of the faintness and slightness of the shadow, penumbral eclipses are difficult to see and often believed to simply be a regular full moon. The next penumbral eclipse will occur on January 10 and 11, 2020, and will be visible from northeastern North America east through Greenland, Africa, Europe, Asia, and Australia to northwestern North America. If you find yourself in the path of any of the upcoming eclipses, check them out! If you’re viewing a solar eclipse, be sure to protect your eyes. Special solar eclipse glasses are available, or you can watch it indirectly with a pinhole projector. You can make one with just two pieces of white cardboard or paper and a sharp pin or needle. Simply make a small, smooth, round hole in the center of one of the pieces, then allow the sun to shine through the hole onto the second sheet. Lunar eclipses, on the other hand, are perfectly safe to view with the naked eye. Berman, B. (2017 Aug 7). “A Total Solar Eclipse Feels Really, Really Weird.” Wired. Retrieved from https://www.wired.com/story/eclipses-feel-weird/. NASA (n.d.) “How Eclipses Work.” ECLIPSE 101. Retrieved from https://eclipse2017.nasa.gov/how-eclipses-work. O’Callaghan, J. (2012 Dec 24). “Will the Moon ever leave Earth’s orbit?” Space Answers. Retrieved from https://www.spaceanswers.com/solar-system/will-the-moon-ever-leave-earths-orbit/. Stephenson, F.R., Zirker, J.B., and Houtgast, J. (2007). “Eclipse.” Astronomy. Retrieved from https://www.britannica.com/topic/eclipse/The-frequency-of-solar-and-lunar-eclipses. Time and Date (1995-2017). “August 21, 2017 – Great American Eclipse (Total Solar Eclipse).” Eclipses. Retrieved from https://www.timeanddate.com/eclipse/solar/2017-august-21. Time and Date (1995-2017). “December 26, 2019 – Annular Solar Eclipse.” Eclipses. Retrieved from https://www.timeanddate.com/eclipse/solar/2019-december-26. Time and Date (1995-2017). “Eclipses: What Is the Antumbra?” Eclipses. Retrieved from https://www.timeanddate.com/eclipse/antumbra-shadow.html. Time and Date (1995-2017). “February 15, 2018 – Partial Solar Eclipse.” Eclipses. Retrieved from https://www.timeanddate.com/eclipse/solar/2018-february-15. Time and Date (1995-2017). 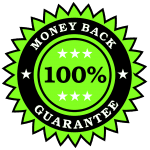 “January 10/11, 2020 – Penumbral Lunar Eclipse.” Eclipses. Retrieved from https://www.timeanddate.com/eclipse/lunar/2020-january-10. Time and Date (1995-2017). “January 31, 2018 – Total Lunar Eclipse.” Eclipses. Retrieved from https://www.timeanddate.com/eclipse/lunar/2018-january-31. Time and Date (1995-2017). “July 2, 2019 – Total Solar Eclipse.” Eclipses. Retrieved from https://www.timeanddate.com/eclipse/solar/2019-july-2. Time and Date (1995-2017). “July 16/17, 2019 – Partial Lunar Eclipse.” Eclipses. Retrieved from https://www.timeanddate.com/eclipse/lunar/2019-july-16. Time and Date (1995-2017). “Make a Projector to Safely See a Solar Eclipse.” Eclipses. Retrieved from https://www.timeanddate.com/eclipse/make-pinhole-projector.html. Time and Date (1995-2017). “What are Eclipses and Transits?” Eclipses. Retrieved from https://www.timeanddate.com/eclipse/eclipse-information.html. Time and Date (1995-2017). 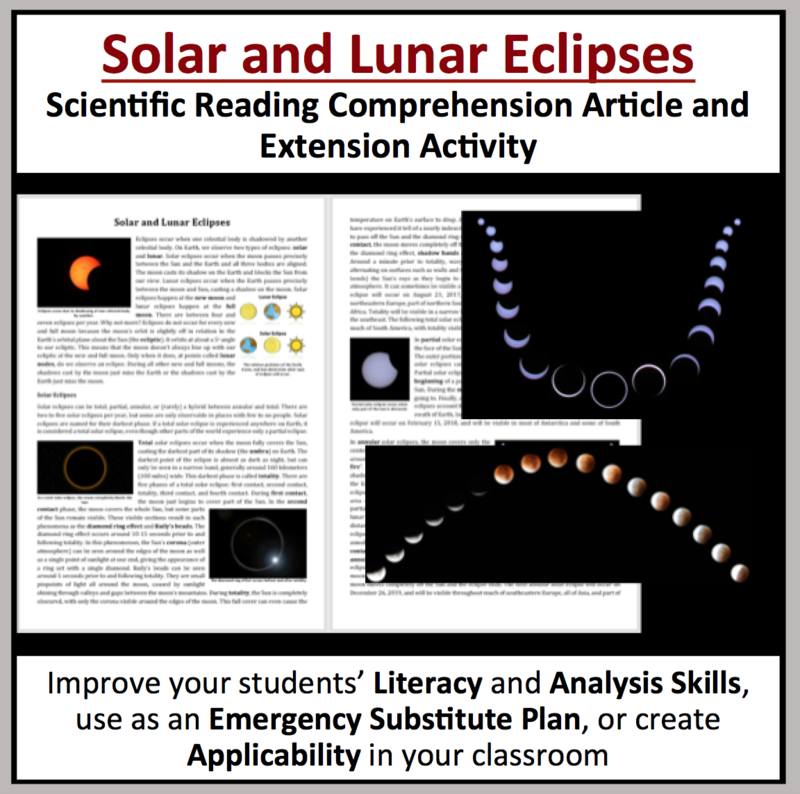 “What Is an Annular Solar Eclipse?” Eclipses. Retrieved from https://www.timeanddate.com/eclipse/annular-solar-eclipse.html. Time and Date (1995-2017). “What Is a Hybrid Solar Eclipse?” Eclipses. Retrieved from https://www.timeanddate.com/eclipse/hybrid-solar-eclipse.html. Time and Date (1995-2017). “What Is a Partial Lunar Eclipse?” Eclipses. Retrieved from https://www.timeanddate.com/eclipse/partial-lunar-eclipse.html. Time and Date (1995-2017). “What Is a Partial Solar Eclipse?” Eclipses. Retrieved from https://www.timeanddate.com/eclipse/partial-solar-eclipse.html. Time and Date (1995-2017). “What Is a Penumbral Lunar Eclipse?” Eclipses. Retrieved from https://www.timeanddate.com/eclipse/penumbral-lunar-eclipse.html. Time and Date (1995-2017). “What Is a Total Lunar Eclipse?” Eclipses. Retrieved from https://www.timeanddate.com/eclipse/total-lunar-eclipse.html. Time and Date (1995-2017). “What Is a Total Solar Eclipse?” Eclipses. Retrieved from https://www.timeanddate.com/eclipse/total-solar-eclipse.html.